What’s your About page like? Does it make you and your team mates likeable? Does it attract the right clients to your business? Does it help you sell your products and services? Writing an About page seems tough. Even experienced copywriters can feel stumped when writing their own About Me page. The blank page is intimidating—especially when you have to write about yourself. How do you let your personality shine through? How do you list your achievements without sounding like a windbag? Next, you learn how to avoid sounding like a self-centered blabbermouth and how to create a flow to engage your readers. This guide cuts through the fluff and teaches you step-by-step how to write what is possibly the most important page on your website – your About page. It’s packed with specific examples and practical advice, all delivered in a friendly and engaging style, and turns a potentially daunting task into a fun and easy process. If your current About page isn’t producing results (or, worse still, you don’t have one at all) this fantastic guide will help you create an authentic, personality-filled page that helps people see you as someone they want to work with. This guide helps you write your About page step by step. Pain free. First, you learn what makes an About page good. Then you follow our suggestions to mix, cook, and garnish your own About page. Percolation makes content tastier, so we suggest you use this guide to write your page over a period of 5 days. Of course, you can go faster or take more time. You’re in charge. You get instant access to the guide and your bonus material. One of the most common questions I get from people who are building a web presence is “What should I say on my About page?” Even the most experienced copywriter breaks out in a sweat when they need to write copy about themselves or their own business! What I love about “A Pain Free Process for Writing Your ‘About’ Page” is that the process is broken down into easy-to-understand steps. The result? An About page that shares the best about what you offer, and leaves potential customers intrigued, and wanting to learn more. I highly recommend this ebook. Once you read it and work through the steps, you will have what it takes to craft an About page that works to boost your business. I didn’t think I needed an ebook to help me rewrite my About page. But now that I’ve read Henneke and Julia’s ebook, I’m excited to dig back into my About page, which I’d been putting off for a while. The numerous examples from other sites make a huge difference, and hand-drawn illustrations are a trip. (Talk about personality!) But most of all, the step-by-step process helps me reboot my energy for recreating that super important page. Henneke and Julia make writing your About page a cinch with easy recipe-style steps. If you’re stumped on your About page, I highly recommend this ebook. I know from my work as a copywriter and from running a business that the About Us page is the hardest one of all to write on any web project. How do you get the tone of voice right? How do you get personality into the page without writing stuff that makes you cringe? This illustrated guide tells you step by easy step how to do it. It’s fun, practical, and will get you there quickly. I love it! This guide is not intended for marketers at conglomerates with a maze of business units and an army of stakeholders. If that’s you, hire a good copywriter to write your page for $1,000 or more. This guide is for small business owners, solo-flyers, and freelancers who need to stand out in a crowded market place. Use this guide to write a page from scratch or add sparkle to an existing About page. Steal the writing tricks from pro copywriters for a fraction of their hiring fee and write your own About page. No copywriting experience required. Sales tax or VAT may apply. This product is sold by and securely delivered via FastSpring. A publication from Enchanting Marketing Ltd. I'm sure you hear this a lot, but I have found tremendous value in A Pain Free Process for Writing Your "About" Page. With paint-by-numbers simplicity, you led me by the hand, and voila! I've created a masterpiece! I've enjoyed the experience immensely. And you taught me tons. Oh, and you're absolutely right: some of the slickest websites have the most gosh-awful "About" pages! ... Your ideas and format really makes sense. Henneke has a unique talent for getting her word across. Using cooking ingredients combined with the cartoon caricatures made the learning experience very easy. I especially loved the day-by-day program. It made the whole process of writing an about page less daunting. I loved how the material was broken down into an easy-to-follow daily task format. My old method of learning was to piece together a lot of information from a number of different sources, and eventually hope to get the whole mess sorted out. This was a refreshing alternative because I had a trust level that I'd be getting the best information on the topic, it was already prearranged, and it ended up saving me a lot of time in comparison to the information-hoarding process I'd relied on in the past. I'm glad I stumbled across this course. It is a big help for me in doing my own blog. Thank you Henneke, your effort is a blessing to everyone who find your course. I recommend this! Henneke made writing a better About Page actually FUN for me. Loved and appreciated her daily encouragement. Now I can't stop myself from making more improvements to my website. I need to join Web Writers Anonymous ... HELP! PS Henneke is a gifted artist too ... so much talent in one person! The ebook helps one take a structured and systematic approach to writing an about page. And now that I have a system in place, I know it'll help me keep improving the about page as I grow my business. Saves me hours of thinking and writing. Thanks again for helping me realize the importance of an About Page for my business and giving me a proven system to implement it with ease. I have had the same About Page for almost 3 years. It wasn't representing me (or my audience) as well as it could be. I took Henneke's "A Pain Free Process For Writing Your About Page" and redid my About page in a few hours over a weekend. Henneke's instructions were spot-on and the examples were so helpful. 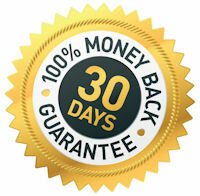 I highly recommend the process - you'll enjoy it and also be helping your website become a conversion machine! This is a great resource full of all kinds of useful tips and practical steps one can take to create a winning about page. I go back again and again to Henneke's book and emails. So many useful tips that continue to improve my writing. I use her ebook and articles like a checklist when editing drafts and sales copy. Thanks for the excellent material. I was hesitant about buying this ebook because I thought it was a bit expensive. I’m stoked I got it anyway. A friend had asked me to rewrite her about page and I wasn’t sure how to start. I had researched a couple of about pages and was trying to analyse what worked and what didn’t, but with Henneke and Julia’s ebook this isn’t necessary - because they’ve done the work for you. Henneke and Julia analyse several about pages and show you what makes these examples engaging and effective. There are lots of questions to answer before you write the first draft, but I didn’t find going through these difficult. They made the writing process easier. Not only is the advice in the ebook valuable, but it's fun to read. And the results? My friend loved the about page I wrote and is going to use it on her website. 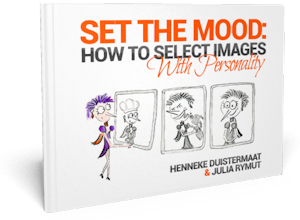 I have read a tremendous amount of material to improve my marketing and website, and without a doubt, Henneke & Julia have created the most understandable step-by-step guide I have seen yet. I was able to apply their advice immediately. In addition to being incredibly knowledgable, they are talented teachers. Thank you. Henneke and Julia make writing what can be a really tricky part of your website manageable and genuinely pain-free. The guide is proof of the old copywriting adage that 'great copy isn't written, it's assembled'. Over 5 days you'll come to understand what your About page is meant to achieve, what elements it needs to contain and how to lay it out for maximum impact. Henneke's illustrations make understanding the concepts really simple and the example page layouts help you make sense of the storyline and flow your page needs. The highlight is definitely the questions to ask yourself when collecting and assembling your messages. Henneke and Julia's advice is spot-on when it comes to writing your About Page. I was making all the "classic" mistakes, writing about me, when really I should have been writing about my reader. I had been putting off writing this page of my website - putting it in the "too-hard basket" and feeling intimidated. But the approach Henneke and Julia lay out makes it easier - small, bite size chunks to cross off each day and before you know it, it's done. The examples at the end of the ebook were especially helpful. I kept referring back to them comparing my page as I went. The email support is also a great motivator. I'd highly recommend this ebook, it's well worth the investment. This guide is the perfect tool for writing an effective about page in record time, no matter the field. As an architect, I found this guide extremely useful. Henneke, Your "pain free process" was just what I needed. I literally have been working on getting my blog going for a year. I wrote and rewrote my about page but it either sounded cheesy or too formal. I continued to put off writing my about page (which meant not launching my blog or writing business) until I received your email inviting me to take the course. You made it seem so easy, like having a conversation with a new acquaintance. The examples you used were very helpful, not only in clarifying what I should be writing, but in understanding that each about page will look/sound a little different depending on the person, product or business it represents. That's the whole point, isn't it? Thanks so much for sharing your knowledge. This ebook really helped me write an about page that "fit" me. I was able to sound like myself, and helped me strike the correct tone for my page. Highly recommended! "A Pain Free Process for Writing Your About Page" is exactly that. It made re-writing my About page both painless and an easy to follow step-by-step process. It explains the 4 essential ingredients with real examples and the details behind why they work. After following the ebook's advice, my page is more relevant, less BORING and more natural sounding than my first one. It's an easy read, full of valuable insights. I highly recommend it. Very happy! Thanks for this exhaustive list. Best wishes. I am working on the outline. I do like your presentation and following your instructions is easy. No overthinking and definitely not getting overwhelmed. Just outline and write it. Keeping the reader in clear focus and what I can do for him/her makes the process so much easier and just as important fun. Thank you Henneke. As a previous Web Content Manager for a Fortune 500 company and a major university, I'd studied all the "how-tos" and had written content for many websites. When I began freelancing and needed to develop content for my own website, however, I was stymied. What the heck could I say about ME that got my point(s) across without making me sound like I had an ego the size of Alaska? Or that I was silly. Or that I was trying too hard. Julia's and Henneke's Pain-Free Process not only guided me through the process - they made it fun! They provide a lot of terrific concepts that they relay with humor. And the examples are great! It's a breakthrough experience no matter what your experience in writing Web pages! 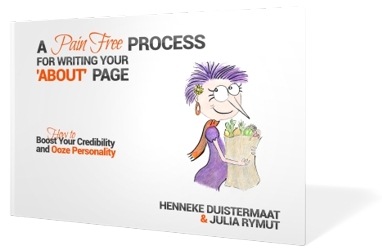 I have literally ravished Henneke’s ebook ‘A Pain Free Process for Writing Your ‘About’ Page’ from beginning to end. 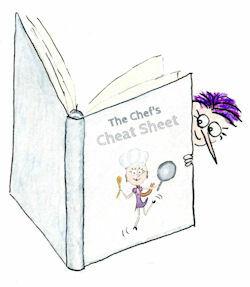 It’s a delightfully easy-to-read and practical guide, with a lot of extra’s. Writing an engaging 'About' page is tough - but not with this guide. Definitely a must read! I also highly recommend following Henneke’s ‘Snackable Writing Course’. Henneke’s ‘Snacks’ are brilliant practical writing tips, that I have added to my SEO copywriting checklist. The step by step detail on how to write an effective About page is excellent. The order is logical and easy to follow. Good examples, very clear instructions. Definitely a keeper. Thank you, Henneke and Julia. The content was extremely valuable to me at the exact moment in time I needed to write something in that sense and could not figure out how. There certainly is nothing I could say in a negative sense. The ebook is great value. Henneke's e-course was instrumental in creating the new version of my 'about' page. I had wanted to improve my page for quite some time. This course provided me with the advice and, more importantly, with the gentle push and motivation I needed to get the job done. It made me think about what the essence is of the work I do. And then it helped me to put that into actual words. Instead of the usual and weak 'hello, this is me' page you see on way too many websites, I now have a much stronger page. It's another doorway for potential clients, newsletter subscribers or blog readers into my world. Highly recommended for anyone who wants an about page that's NOT crappy, boastful or self-centred, but genuine, engaging and helpful. This is THE ‘must-have’ guide for anyone who understands the importance of optimizing their web site. Though targeted at the About Page, optimized text can be used for any of the social media. Written in easy bit-sized instructions, Henneke and Julia have created an essential tool for building your online business. This guide jumpstarted my career. Thank you. Want to craft an engaging About page, too?